Tour DZero & the Tevatron, site of the top quark discovery. Program: Tours include stops at the DZero assembly hall, the control room (where the screens replay images captured during DZero detector operation) and the Tevatron tunnel. They culminate in the detector and its collision hall. In the assembly hall area there is a special explanatory display. Limited photography. When: 1:30 PM to 3:30 PM on the first Tuesday of the month (except holidays). Audience: Members of the public with a keen interest in science!School groups should instead arrange for high school tours. Requirements: The minimum age for the tour is 14 years oldNo exceptions. Non-heel, closed-toe shoes are required. Visitors must be able to walk up and down staircases. What scientist Dmitri Denisov says: "It is a great opportunity for Fermilab employees and for the public to see the wonder of the engineering and the technology that goes into a complex particle accelerator detector, ... When people tour here, they feel that it is like a rocket launch. It really makes you say, 'Wow! People can really do such complex, amazing, wonderful things.'" Registration: Reservations are required and space is limited. To register for this event, go to the Special Events Calendar or the Online Registration. Click the pencil icon next to the event. Other details: As part of the program, you will receive a brief orientation about radiation safety at Fermilab, and we will ask you to acknowledge that you have been given the opportunity to ask questions regarding hazards that may be encountered during the tour. 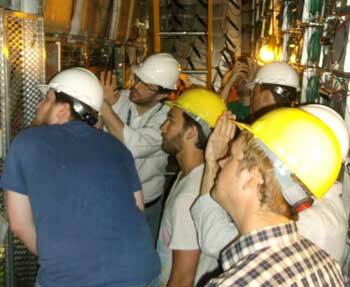 Looking deep inside the detector.